A quartet of shows at MoMA decoct enlightenment from the banal. Just when you might have thought that the Museum of Modern Art had become little more than a voracious real estate investment trust with a sideline in maintaining a great art collection, it wrong-foots you with an exhibition program that couldn’t be more nourishing for the soul. I’m thinking, for one, of “There Will Never Be Silence: Scoring John Cage’s 4'33",” a small gathering of works from the collection (on view through June 22) organized by the museum’s curator of drawings and prints, David Platzker, with Jon Hendricks, the artist who serves as consulting curator for its Fluxus collection. The show concerns not only Cage and his notorious “silent composition” but also how that seemingly outlandish gesture took its place, as Cage hoped it would, as “an action among ten thousand: it moves in all directions and will be received in unpredictable ways.” Cage offered this explanation to a friend who’d called 4'33" “a schoolboy’s prank.” The friend was Helen Wolff, the renowned book publisher, whose son, the composer Christian Wolff, had become one of Cage’s closest musical comrades, and it’s charming to see both correspondents cite the I Ching to bolster their positions. It was Helen and her husband, Kurt, who first published, at Pantheon Books, the famous Baynes-Wilhelm translation of the sibylline Chinese text, which Cage had begun using as an aid to composition a few years earlier. It may seem surprising that any sort of illumination can be found in the banal spaces of Glenn Lowry’s corporatized MoMA. But why be surprised? To decoct enlightenment from the banal, like finding music in the silence that can never be, was always the goal for artists like Brecht, quite distinct from that of escaping the commonplace. Paul Gauguin was the great escapist in modern art, and MoMA is presenting a scholarly, original and instructive show of his art, too. On view through June 8, “Gauguin: Metamorphoses” turns the spotlight away from his paintings and shines it on his prints and transfer drawings, and to a lesser extent on his sculpture in ceramic and wood. The show is large (around 150 works, all from the last fourteen years of the artist’s life) but understated, and no less important for that. Here we see Gauguin the experimentalist, who turned to printmaking (or to various hybrids of painting or drawing and printmaking, such as transfer drawings and monotypes), not only to circulate his images more widely but also to change them by reproducing them. He was not interested in adhering to a model, but rather in finding something new and unexpected in it. Gauguin wrote of himself in the third person (“He traces a drawing, then he traces this tracing, and so on till…he decides that it does not resemble the original any longer. Then!! he signs”) and was undoubtedly a mythographer: he mythified himself as well as the Tahitians and other Pacific Islanders whose worlds he tried to understand and explore. But perhaps in accord with his conviction that to be “mysterious” is a value in itself, his myths (and their embodiments in images) were always unstable, unsettled, in transition. Gauguin the carver of wood reliefs turns out to be the same artist who scored the surface of woodblocks. You almost want to ink the surface of a cylindrical sculpture such as Hina With Two Attendants or The Afternoon of a Faun, both from around 1892, and roll it across a sheet of paper to test the result. It’s surprising that Gauguin never tried it. He delighted in the changes that his imagery underwent as it migrated from one medium to another or was reprised in the same medium, as when he treated the same woodblock very differently to produce profoundly different interpretations of it: here strongly outlined and almost monumental, there blurred and evanescent—for instance, as in Savage (1894), done the same year that Gauguin made a tremendous ceramic sculpture of the same figure. In the prints, she seems to appear and disappear like a ghost; the sculpture, which the artist had wanted to mark his grave, is by comparison almost reassuring in its fearsome immobility, rooted like a tree trunk. Gauguin’s transformative repetitions link him not only to his older friend Edgar Degas (who insisted, “It is necessary to execute a motif ten times, a hundred times,” in order to find its truth) but also to Jasper Johns, who famously gave himself the following instructions: “Take an object. Do something to it. Do something else to it.” Johns is included, naturally, in “There Will Never Be Silence”—he and Cage were good friends. But as “Jasper Johns: Regrets,” MoMA’s small display of his recent work, suggests, Johns has as much in common with Gauguin as with Cage. For Johns, copying, printing, reprinting, repeating and manipulating are means for exploring the potential of a motif and to discover something new within an existing work. Even before Johns got to work on it, the photo was already an object that someone had manipulated and then manipulated again: it is crumpled and paint-spattered and, most notably, a big piece of its lower left corner has been torn away, so that the photo as a whole resembles a squarish palette, the missing piece seeming to invite a hand to hold it. Johns has traced the image, retraced it, flipped it to make it mirror itself—in short, put it through its paces in a multitude of drawings and prints as well as two grave gray paintings. In the bulk of them, the most prominent element is a symmetrical shape looming up from the bottom that is the form of a doubled absence: the mirrored shape of the torn-off part of the photo. But the most haunting element is the one just above that, where the tracings of the cracks on Bacon’s studio wall, mirrored, have magically transformed into a skull. Maybe an artist’s process always eventually leads to that gloomy souvenir, the memento mori (though for Gauguin, it was manao tupapau, “watched by the spirits of the dead”)—but how it does so can be surprising. Besides, all’s not entirely grim. The title “Regrets” comes from a legend stamped on many of the works, a blow-up of a rubber stamp that Johns apparently uses in replying to invitations: Regrets, Jasper Johns. So the works have a signature that’s just a reproduction of a signature below a title that’s just an empty social form. “Regrets, I’ve had a few,” sang Frank Sinatra, “but then again, too few to mention.” Johns may not be revealing his regrets either, but in the chilly, brooding atmosphere of these works, they linger. Cage and company, Gauguin and Johns would each be reason enough to make one’s way to midtown Manhattan. But the main attraction at MoMA right now is “Alibis: Sigmar Polke, 1963–2010,” which is billed (not quite justifiably) as “his first truly comprehensive retrospective.” Yes, the show, curated by Kathy Halbreich and on view through August 3, is comprehensive in the sense that it encompasses the vast range of techniques that Polke used—not just painting and drawing but printmaking, photography, film and more—and shows how they were part of a single yet irreducible life’s work. 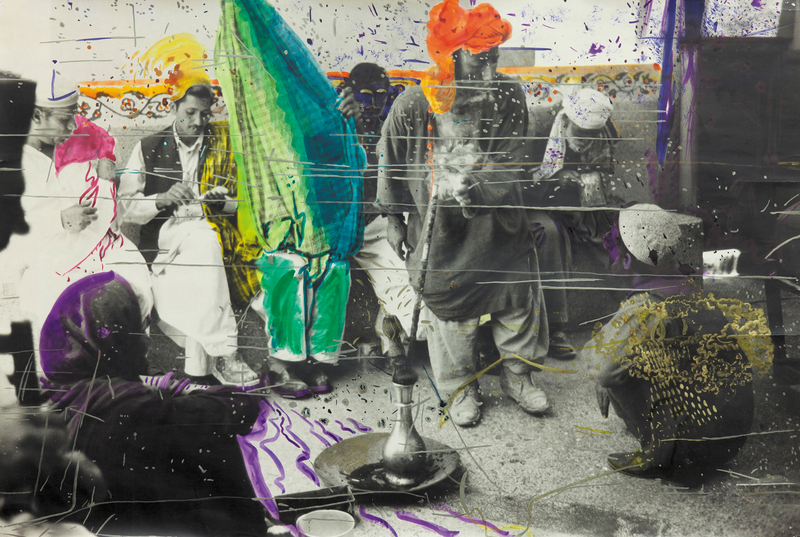 Polke was always quintessentially a painter, even when using photograph or film. His endlessly changing, endlessly transformative approaches to painting would not have been what they were without these other techniques. But chronologically comprehensive, the show is not. This felicitously jam-packed exhibition of more than 250 works has been installed in an atrium and ten galleries, and Polke’s work from the 1960s through the 1980s occupies ten of those spaces, while his work of the 1990s and 2000s (the artist died in 2010) is focused in just one room. Perhaps Polke worked less assiduously in the last two decades of his life—although that wasn’t my impression from the show of his more recent paintings that I saw at the Tate Modern in 2003, or from his contribution to the 2007 Venice Biennale. Or maybe Halbreich and her colleagues simply didn’t like his later work as much, or didn’t think it adds to the luster of his earlier work; this seems more likely. But a retrospective that trails off in this fashion can’t claim to be comprehensive, and the curators owe their public an explanation for this choice. But as he continued painting through the 1970s, Polke’s work became less blunt, more nuanced, and also unstable. He began cultivating chance effects, the accidental and the unexpected. By 1982, when he painted the set of three large, dense, nocturnal abstract paintings called Negativwert (Negative Value), he seemed to have become quite a different sort of painter. On one level, the works are genuine experiments, attempts to determine how many different colors can be drawn out from the use of a single violet pigment. Yet the point is more than mere bravura. The huge organ chords of dark hues in these paintings might have appealed to Mark Rothko. It’s as though the search for every last nuance of tone really had become a kind of divination, a search for connection to something transcendent after all. But Polke’s search is justified by his unstinting awareness of never being able to achieve transcendence: the material glut of everyday life was always close at hand, the nightmares of history always looming. Between 1984 and 1988, he produced a group of paintings whose uncanny power has much in common with that of the Negativwert paintings, except that in each of them, the nonrepresentational, alchemical mixtures of colors are crossed by the sometimes overriding, sometimes ghostly and indistinct form that gives the paintings their title: Hochsitz, or Watchtower. You can think of the towers that overlooked the Nazi death camps—whose creators insisted that, as members of the Aryan race, they were “higher beings” than their victims—or those surveilling the borders between East and West Germany, or any of the other watchtowers that have imposed their warnings over the watched. Polke knew the piece would change but could not have foreseen exactly how. Like Cage, he was fascinated by chance and had a need for (but also a much stronger resistance to) the silencing of his will. Like Gauguin, he was fascinated by the exotic (traces of his travels to places like Tunisia, Afghanistan, Pakistan, Thailand and Papua New Guinea are visible throughout his oeuvre), and like both Gauguin and Johns, he emphasized process over product. He would have appreciated how Johns could summon the appearance of a death’s head from some cracks in a wall. Although Polke could make a surveillance tower slowly disappear, who knows what he would have thought of the ability of Glenn Lowry and company to make a museum vanish. As you exit MoMA, take a glance at the scaffolding in front of what was once the home of the American Folk Museum and give it a thought.